Our local guide will meet you at your hotel at 8:00am and then drive to Simatai West. 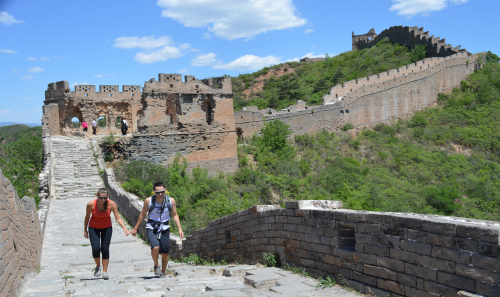 Start your hiking to the adjacent Jinshanling near 10:30am. 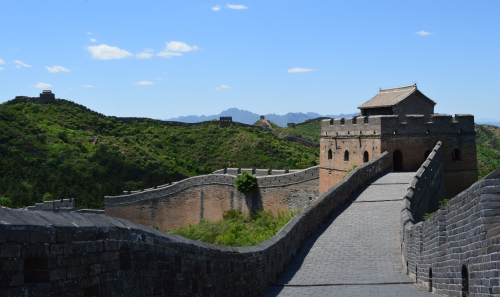 The two sections of the wall are in a more natural state than other sections of the Great Wall. It's a 3-hour walking rewarded with the awesome spectacular, extremely photogenic. Steep gradients offer constantly changing perspectives and wide, open views. Also watchtowers are in fascinating variety. Some have two storeys, others three. Some have flat roofs, others rounded and others again are pitched with upturned eaves. This section of the wall is wild, ruined, preserved and original. What's more, very few other visitors make you feel that you had the place to yourself. Later, have your lunch at a local farmer’s restaurant and you'll be transferred to your hotel.